100 miles north of Green Bay, WI on the shores of Lake Superior. 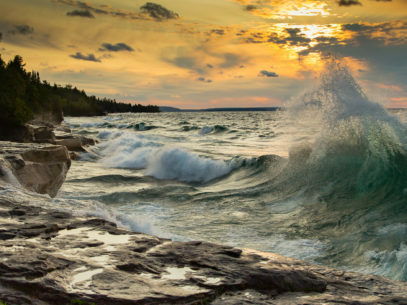 Lake Superior with a northwest wind causes sizable waves to crash on its shoreline. Add an overcast afternoon where the clouds are breaking up at sunset and you get some pretty dramatic conditions.